After giving a power-packed performance in Jigarthanda, Bobby Simha as Assault Sethu has retained a special position in our hearts. His next film Urumeen (as the hero), directed by Sakthivel Perumalsamy is in its last leg of shooting. The film's crew exclusively updated to Behindwoods that the film will be wrapped up by this month end, as the climax is the only portion yet to be shot, which will be followed by the post production work. The music, composed by Achu is said to release in the end of March. The movie is likely to hit the screens in May or June this year. 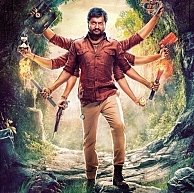 The director, Sakthivel Perumalsamy was very elated about the performance of Bobby Simha as the actor in lead role and said to Behindwoods correspondent, "I hope you are all satisfied with the teaser. Expectations for Bobby are very high and we hope to not disappoint you". When asked how well he could pull off the heroism in the film, Bobby kept it very simple, saying, "Anything for art". This promising actor seems to have a lot in store for us. The team Urumeen seems very excited about the film's release. Watch this space for more updates on audio and film release dates of Urumeen! Exclusive: Vijay’s Puli release plans! From an honest detective to an illegal car racer! Paambhu Sattai Is Bobby Simha's Next ! Bobby Simha On A Double Hat-trick ? What Jigarthanda Did To Bobby Simha? People looking for online information on Bobby Simha, Sakthivel Perumalsamy, Urumeen will find this news story useful.